Cleanse and Detoxify your liver! LiverDTX 1 contains herbs, amino acids, and anti-oxidants which support detoxification and cleansing of the liver. LiverDTX 2 contains a blend of ayurvedic herbs that help support optimal liver function. LiverDTX works on two different levels. First, it works to improve the natural cleansing and detoxification action of the liver by enhancing both Phase I and Phase II liver detoxification. Second, LiverDTX works to support and enhance liver function, which helps to regulate and normalize the production of hormones, enzymes, and blood sugar levels. In this way, LiverDTX not only helps support the liver, but assists in thousands of bodily processes that are necessary for optimal health. 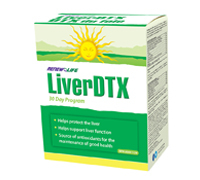 LiverDTX also helps stimulate the liver’s production of bile, which is required to emulsify dietary fat. Bile is also used as a vehicle to carry toxins from the liver into the small intestine, where they are absorbed by fibre and removed from the body through the colon. LiverDTX is a 30 day cleansing program. It can be taken for up to 3 consecutive months without a break, if needed. After 3 months, take a 14 day break before resuming. Should I make any changes to my diet or lifestyle? Drink 8 – 10 glasses of pure filtered water or spring water per day. Add fresh juices from beet, spinach, carrot, and cucumbers. to assist the liver in its ‘ Phase II’ detoxification process. Cabbage, broccoli, and brussel sprouts, as well as foods rich in B Vitamins (whole grains) and Vitamin C (peppers, tomatoes, and citrus), will ensure healthy functioning of the liver’s ‘ Phase I’ detoxification processes. Include Organic Clear Fibre and Norwegian Gold Critical Omega as part of this program. 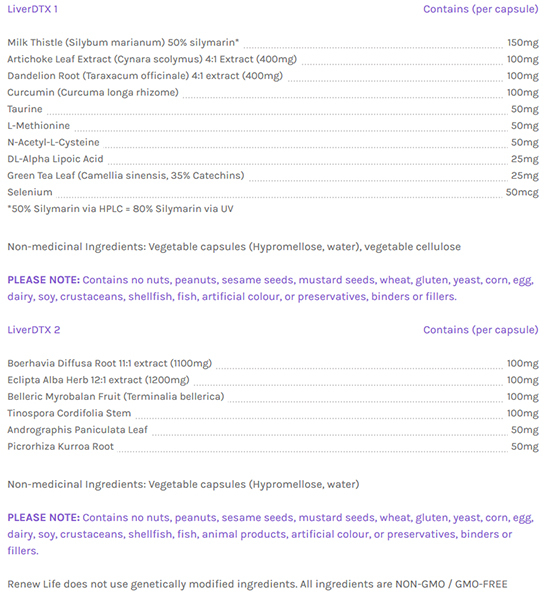 Please check the warning on the label of the box for specific contraindications. If you are taking any other medications and are unsure, the best course of action is to consult your pharmacist or registered health care practitioner before starting any herbal cleansing program. If you do decide to perform this cleanse, take your medications at separate times from LiverDTX (at least 3 hours). After taking LiverDTX, how long should I wait before eating? You should wait a minimum of 30 minutes before eating or take the capsules 3 hours after eating. Directions for Use: Take 1 capsule of LiverDTX 1 twice daily with meals providing protein, take 2 capsules of LiverDTX 2 in the evening on an empty stomach (3 hours after eating). Use for a minimum of 3 weeks to see beneficial effects. Continue for 30 days. Consult a health care practitioner for continued use beyond 12 weeks. Warnings: Consult a health care practitioner prior to use if you have gallbladder diseases (gallstones or a bile duct obstruction), stomach ulcers, excess stomach acid, diabetes, cystinuria, or iron deficiency, high blood pressure, and/or a heart condition. Consult a health care practitioner prior to use if you are taking antiplatelet medication, blood thinnings, nitroglycerin, or antibiotics. Consult a health care practitioner prior to use if you have a liver disorder or develop symptoms of liver trouble (such as abdominal pain, dark urine or jaundice), or intestinal obstruction.